Ciaran Caldwell admits Glentoran’s performance in the Danske Bank Premiership last season fell way short of the Oval club’s expectations. The Glens finished in sixth spot following a disjointed campaign before losing out to Cliftonville in a Europa League play-off. The two sides renew rivalries in the Premiership on Wednesday night. 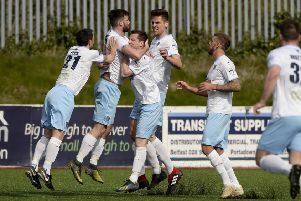 Glentoran won their season opener against Dungannon Swifts at the weekend, while Cliftonville were held to a 2-2 draw by newly-promoted Ards. “We definitely need to improve on last season. That finish wasn’t acceptable,” midfielder Caldwell said. “It will be tough, because most teams have strengthened and are better equipped this season. “Crusaders, Linfield, Glenavon, Cliftonville and a lot of other teams will be up there. “Wednesday is another tough one. Cliftonville beat us in the Europa League play-off at the end of last season, so maybe we owe them one. “Any time we played them last season was pretty tight, and it will be something similar on Wednesday. “They obviously didn’t get the win they wanted on Saturday against Ards, so they will be hoping to bounce back. While this season represents another major challenge for Glentoran, Caldwell admits there is added pressure on his own performances. The 26-year-old signed for the Glens last September but struggled to find any consistency during his year in east Belfast. But after scoring the winner in Saturday’s victory over Dungannon, Caldwell hopes he can become a permanent feature in Alan Kernaghan’s side. “I came here last season with big expectations, and it was tough. I was banned for six or seven games and I was overweight,” he said.